Founded in 1982, Callaway is renowned for developing innovative products that help golfers hit longer and straighter shots from tee to green. In 2017, Callaway released its new Rogue club line, the first line to include the patented Jailbreak technology, which has resulted in their drivers being ranked #1. Our challenge was to showcase not only their leadership position to attendees at the PGA, but their recently purchased OGIO golf bags. The exhibit consisted of five separate contiguous space. This gave us an impressive 18,762 square feet to highlight each independent brand, while also maintaining Callaway’s corporate identity. 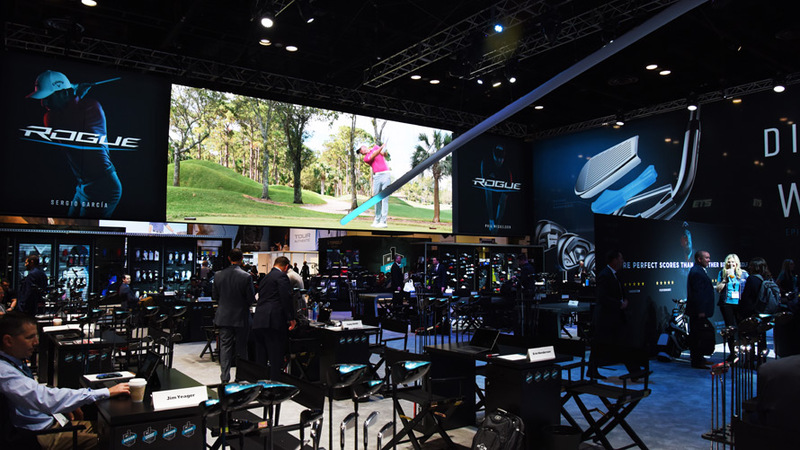 To highlight the new Rogue line we used a 40′ LED tile video screen synced with audio, along with a custom made LED pro-tracer. A golfer appeared on the large screen, preparing to tee off. When the ball was hit, the LED pro-tracer light would turn on and shoot across the booth at a span of approximately ninety-five feet, drawing attendees to the exhibit. This mimicked the experience of watching golf on television and being able to follow the ball with Pro-tracer technology. An important aspect of the booth was to include hands-on experiences. 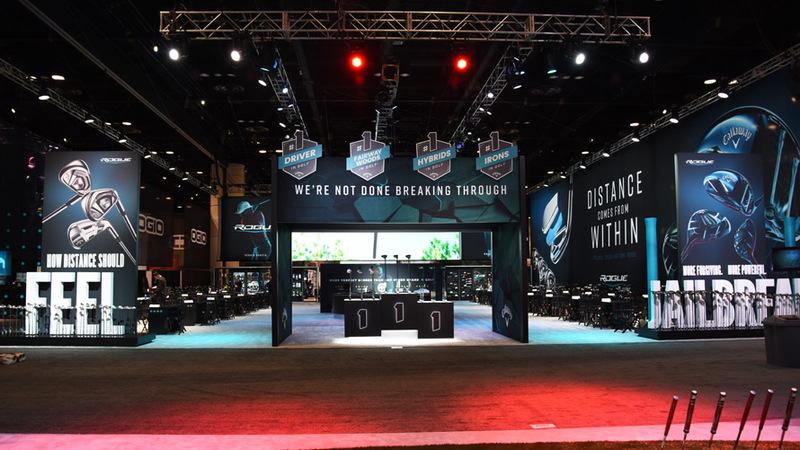 A seventy-five foot putting green, two top golf hitting bays, along with a VIP simulator allowed attendees to interact with multiple products and have the opportunity to experience the capabilities of the brand. Other highlights include a media stage for live podcasts that were recorded throughout the event, thirty-two meeting stations for sales’ staff to facilitate deals on the show floor and twenty-five foot fabric banners that were used around the perimeter of the booth to define the space from other exhibitors. These banners fully enclosed the booth, creating a fully immersive Callaway experience for visitors.